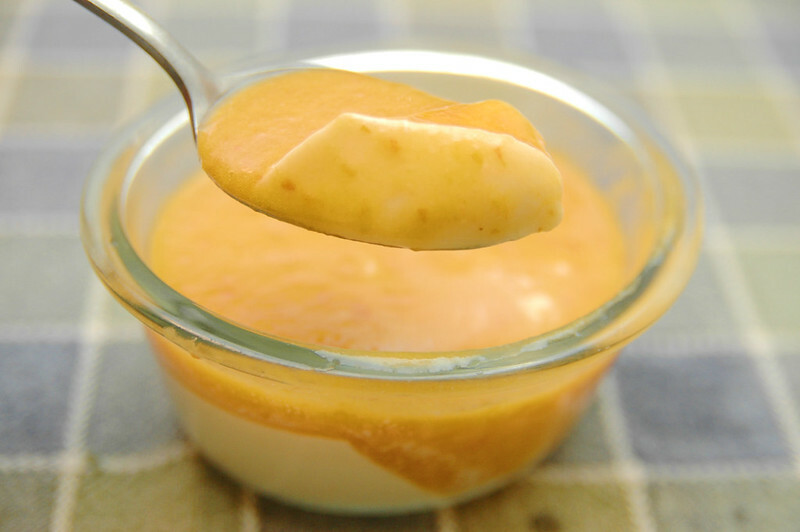 recipe: maple panna cotta with peach coulis. i was eating dinner at driftless cafe and finished it off with an excellent panna cotta ( i was reminded by the staff that they use organic valley half and half and organic valley heavy whipping cream which always makes me happy to hear 🙂 ) and it made me wonder why i didn’t make a homemade version. it’s easy to make, uses two of my favorite ingredients and can be the used as the base for a nearly infinite number of variations. perfect! we have plenty of frozen peaches to use in the freezer so i thought i’d start with a maple panna cotta with peach coulis similar in spirit to this strawberry panna cotta and this peaches and cream panna cotta shots. i used agar-agar flakes in lieu of animal gelatin because, well, i generally try to avoid animal gelatin. i’m guessing a panna cotta purist might scoff at using agar. 2. transfer mixture to ramekins, cover and put in the refrigerator for 2-3 hours. 3. heat peach frozen quarters and sugar with a small amount of water until a thickened peachy sauce is formed. i’m no panna cotta expert, but i believe it’s supposed to have a consistency just slightly thicker than pudding and this batch was pretty close. unsurprisingly, the maple and peach flavors were quite complimentary. A++, would make again! Previous Postfrida wuvs to have her ears wubbed.Next Postday 3396: almost done with the percy jackson & the olympians series!